Do video game geeks want to watch classic cooking shows? A new experiment on the Amazon-owned video game streaming service Twitch is looking to answer that question, as the company today announced the debut of a full-time Food Channel that will include all 201 episodes of Julia Child’s “The French Chef.” Child’s famous show is kicking off the launch of this channel, which will ultimately be filled with interactive cooking shows from Twitch’s own users. The move into yet another non-gaming arena signals Twitch’s intention to expand beyond its video gaming roots. While the network is still primarily about watching games, e-sports and chatting with other gamers, the company found that its community members were sharing other types of video content, as well. Users were sharing streams of activities like painting, illustrations, songs, costumes and even glass blowing. 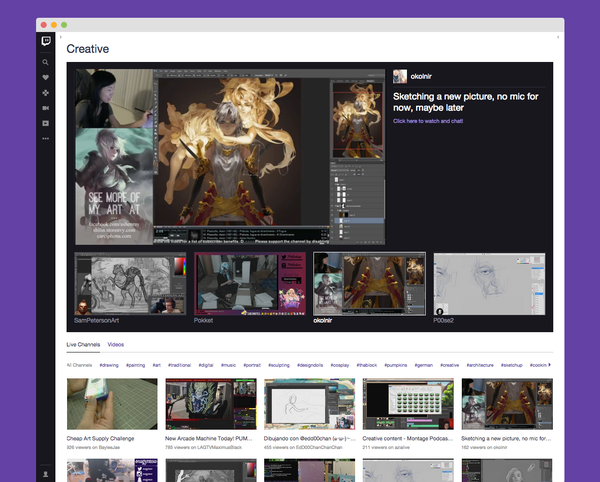 Last fall, the company decided to corral this content into a standalone vertical known as Twitch Creative. While many of the arts and crafts videos were inspired by gaming and gaming culture, it also unveiled a new source of new traffic for the streaming site. The following month, Twitch further capitalized on users’ broader interests with the launch of a Bob Ross marathon. The site streamed Ross’ “The Joy of Painting” on its network, attracting 5.6 million unique viewers and 183,000+ peak concurrent viewers. The success of the marathon led to a decision to keep Ross around by giving his show its own weekly time slot on the site. Similarly, Twitch is hoping to again take a cue from its own user base’s interests with its cooking channel. Today, Twitch personalities, including DomesticDan, CookingForNoobs, FakeGamerGirl, Goldamsel, WorkingChef and Lulaboo, are already live broadcasting from their kitchens, for example. Today is the anniversary of Child’s graduation from Le Cordon Bleu in Paris, which makes it as good a time as any to kick off the all-episodes marathon of “The French Chef.” The Twitch marathon will compact the series into a four-day event beginning March 15th at 2 PM PT. Other user-generated cooking shows will begin airing after the marathon completes. The news of Twitch’s further expansion beyond gaming coincides with an unrelated announcement called “Stream First,” which is focused on getting developers to build broadcasting capabilities into their games from the get-go, instead of after the fact.